I first started using a digital DSLR Easter weekend ten years ago and at about the same time I started using Flickr and after ten years and many, many photographs I am still surprised by the fact that I discover something new almost every day. 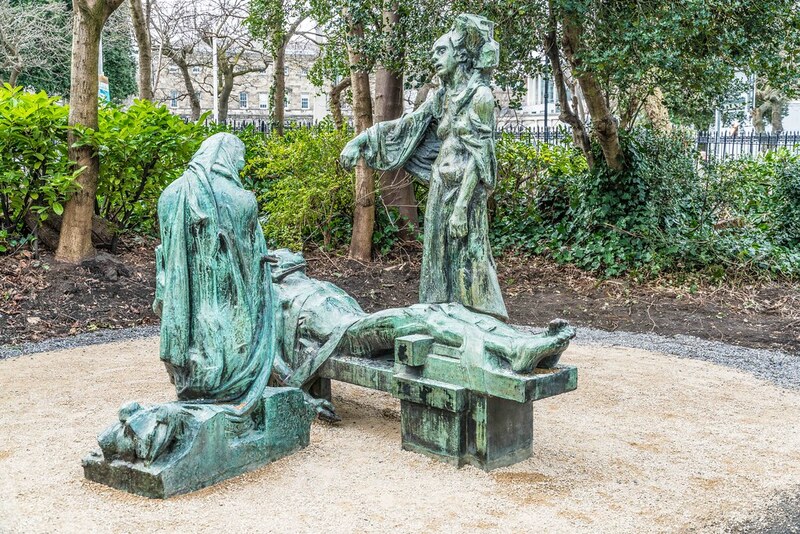 Today I thought that it might be a good idea to photograph scenes and events relating to Easter so I visited Merrion Square with the intention of photographing this public art installation because I thought that it depicted the removing of Jesus from the cross. 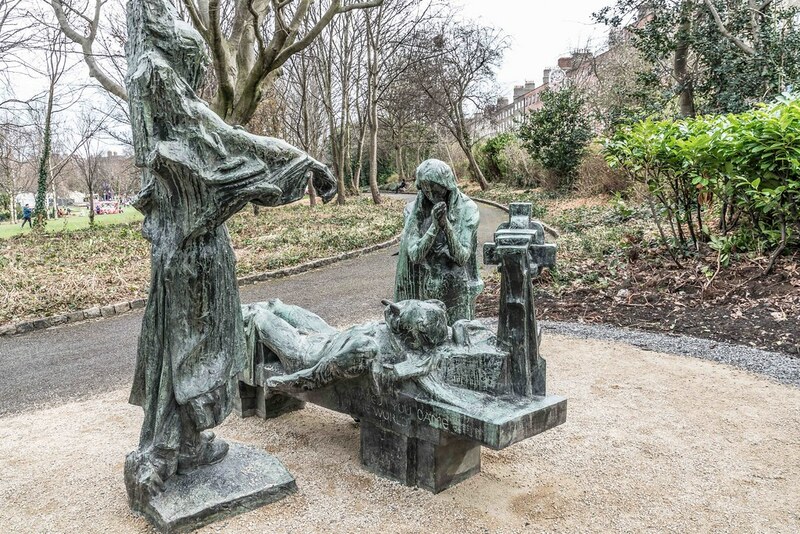 While I was photographing a young girl asked her mother “is that God lying on a table” but I discovered that it is a lot more complicated that that. 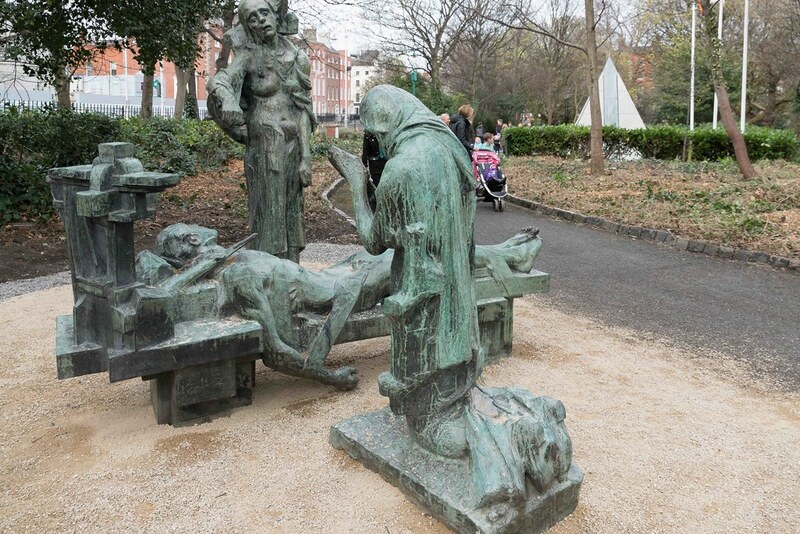 This figurative sculpture, The Victims originated as a part of an unexecuted project for a war memorial for Washington, DC. The artist, Andrew O’Connor, conceived the idea of a huge war memorial in about 1918 and worked on the project until at least 1931. However, no such monument was ever commissioned from him. The memorial consisted of three sections. The first of which was a group of three figures; a dead soldier strapped to a bier, mourned by his wife and his mother. 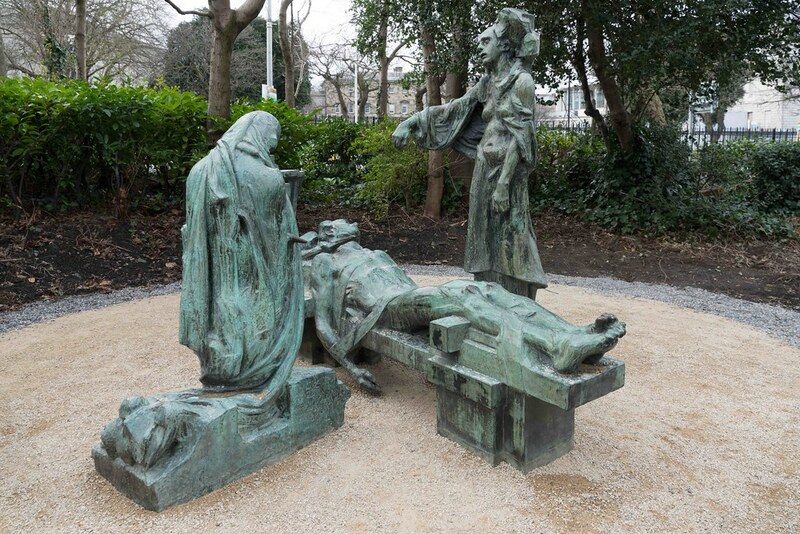 The figure of the dead soldier is The Victim, inscribed with the words; ‘Naked you came into the world’, the kneeling figure of The Wife with her hands clasped in prayer is variously called The Virgin or Mother of Sorrows. She is inscribed; ‘As cranes chanting their dolorous notes traverse the sky’ which is taken from a translation of Dante’s Inferno. 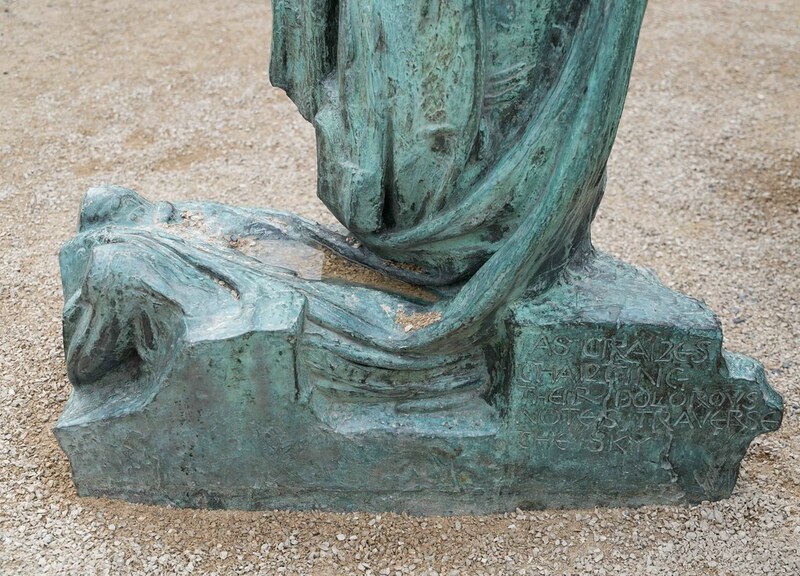 The standing female figure of The Mother of the Hero leans mournfully on her left elbow. 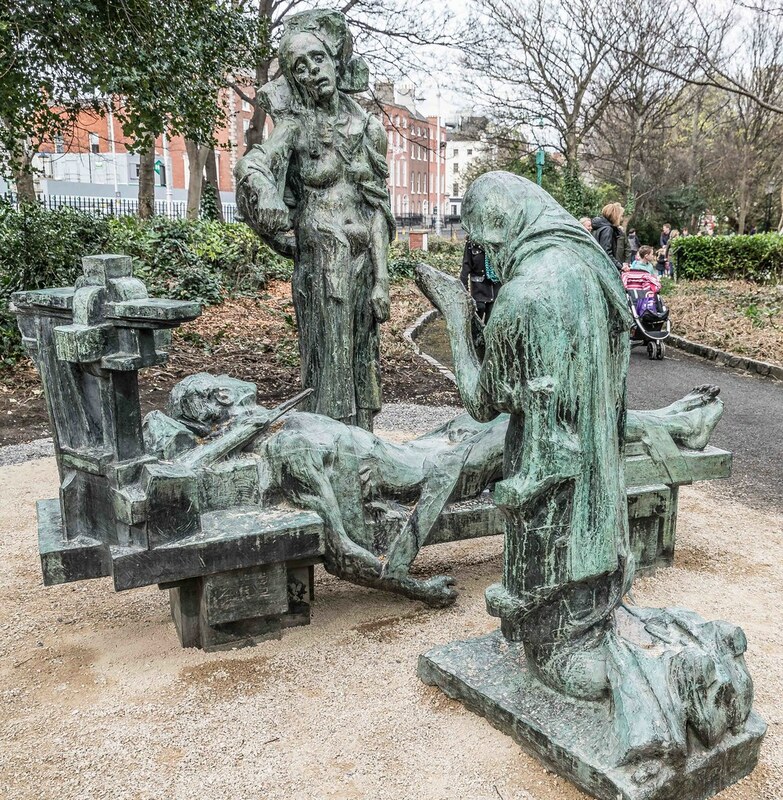 The Victim was presented by the family of the sculptor to the Dublin Municipal Gallery (now Dublin City Gallery The Hugh Lane) in 1947 while the other two figures were presented to the gallery by the sculptor in 1938. As is often the case with O’Connor’s work he produced other versions of some of these figures. 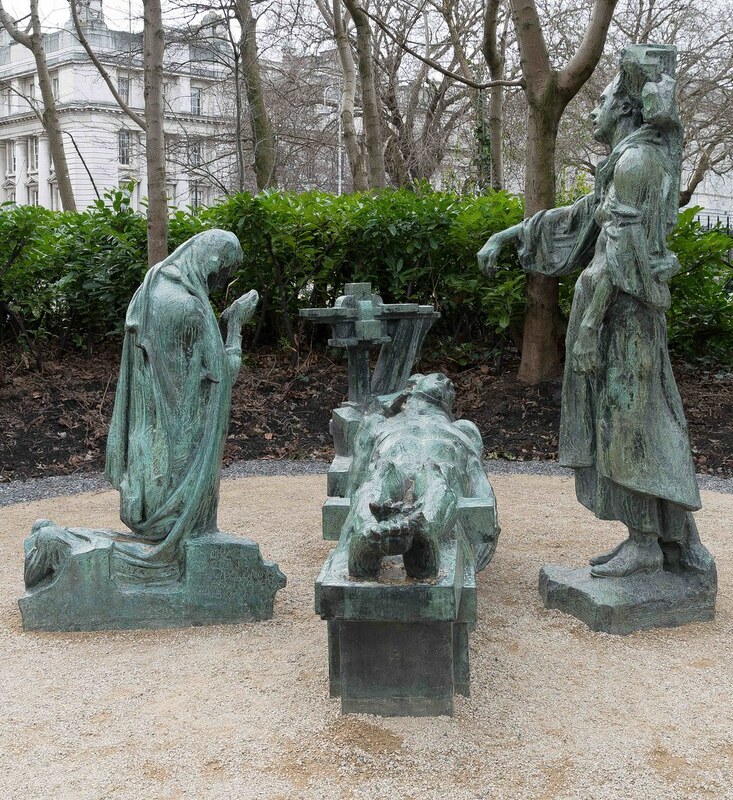 A plaster version of The Victim is in the O’Connor family collection and a version of The Wife is at the Tate Gallery, London. 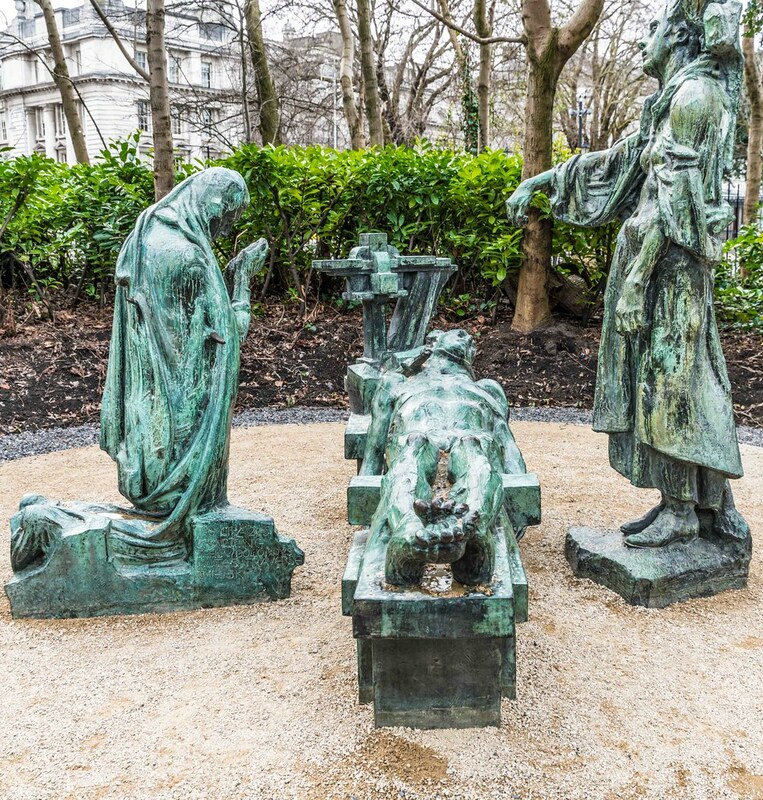 The group would have been assembled with The Victim on a raised plinth, his wife kneeling at his head, his mother standing at his feet. 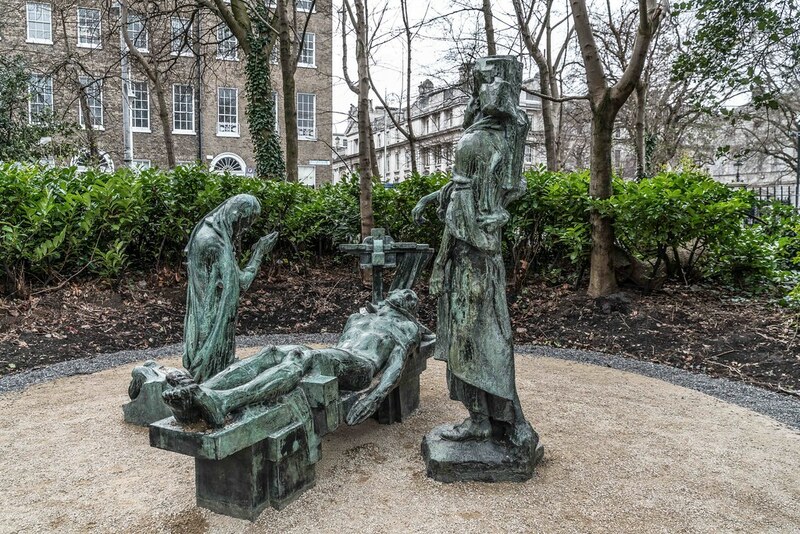 The Victims was installed in 1976 following an exhibition to mark the centenary of the sculptor’s birth at Trinity College Dublin in 1974. 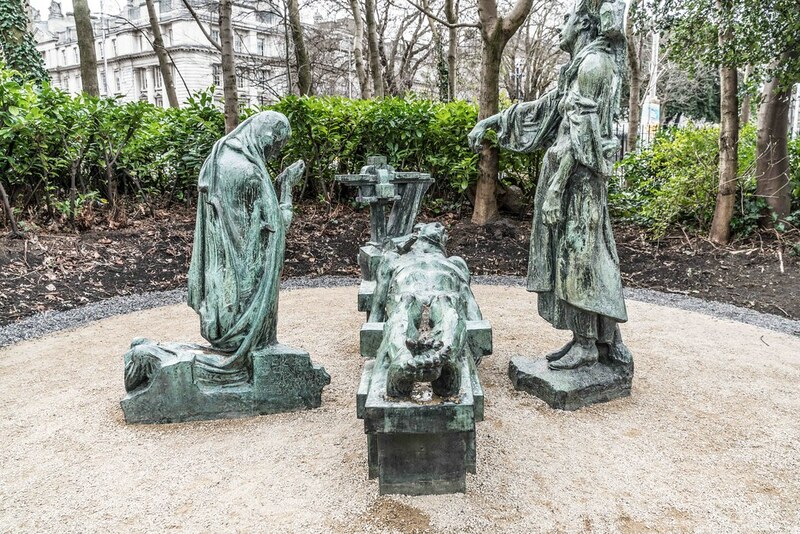 It would appear that it was not until 1974 that the three figures were displayed together as originally intended creating this uncompromising figurative representation of the victims of war. Born in Worchester, Massachusetts, USA in 1874, Andrew O’Connor was the son of an Irish-American sculptor of the same name. Having studied under his father, O’Connor Jr. began working regularly on public monuments and funerary commissions in the United States. In London c.1894-8, he met John Singer Sargent and assisted him on reliefs for his Boston Library decorations. Andrew O’Connor’s style was formulated by the time he first visited Paris in about 1903 and his earliest work is in the Franco-American style which had become popular in America by 1900. Unlike the majority of other American sculptors he remained in France and worked from a Paris studio up to 1914. From 1906 on he exhibited annually at the Salon in Paris and at the Royal Hibernian Academy in Dublin in 1907. 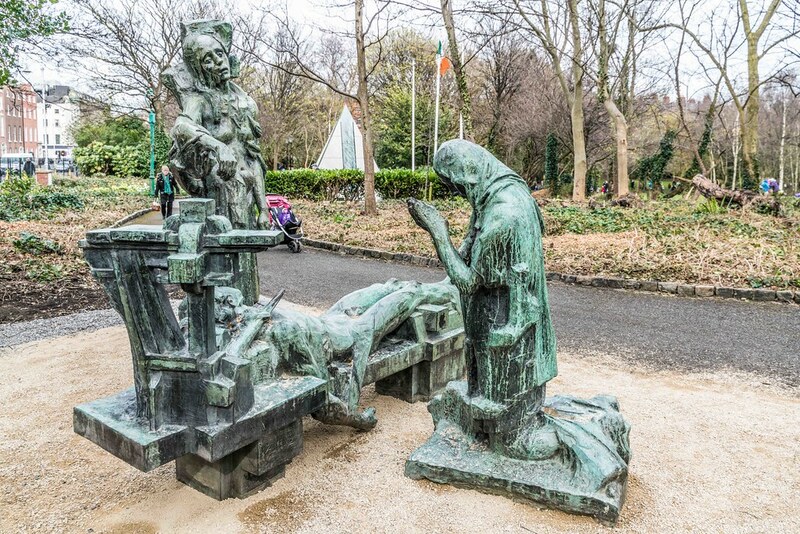 He then returned to the USA from 1914 to the mid 1920s and received numerous commissions for funerary and public monuments including the monument to Lincoln in Springfield, Illinois and the Theodore Roosevelt memorial at Glenview, Chicago. O’Connor spent his last years in Europe, first in Paris, then from c. 1932 between Ireland and London. 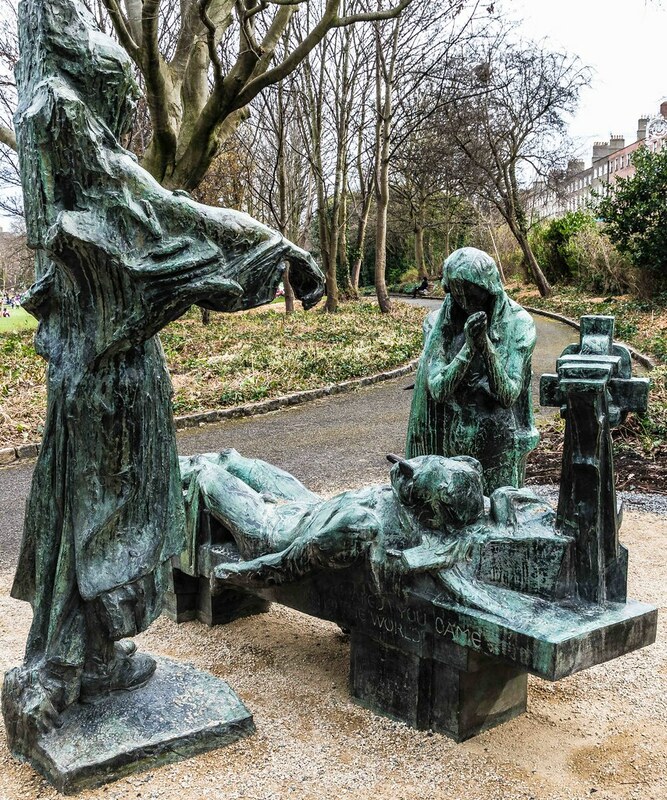 He resided in Dublin for the last seven months of his life and passed away at his home at No.77 Merrion Square.